In the last week or so, I began reviewing additional shaky leaf hints at Ancestry for some of my more recent ancestors. I was appalled when I looked at the family trees that included my ancestor James M. Thornton. Let's look at some of the erroneous information I found. Erroneous information: James M. was born in Georgia. Fact: James M's Civil War (Union) pension file gave his birthplace as Jefferson County, Alabama. Censuses consistently listed James M.'s birthplace as Alabama. Erroneous information: James M. was in the 1880 Lincoln County, Tennessee census. 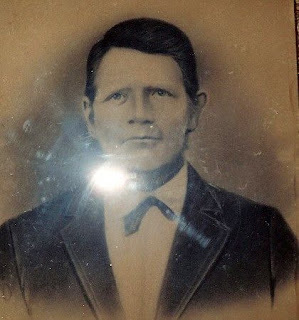 Fact: James M. was enumerated in Franklin County, Alabama in 1880. [See 1880 United States Federal Census, Franklin County, Alabama, population schedule, Newburgh, Beat 8, SD 1, ED 95, p. 627B, family 35, lines 9-15, Jas. M. Thornton family; digital image, Family Search (https://familysearch.org/ark:/61903/1:1:M4JJ-N64 : accessed 23 Apr 2016); citing National Archives microfilm publication T9, roll 13.] Those who accepted the Lincoln County, Tennessee census are likely accepting it because James M.'s first wife's name was Lucinda. However, she died in childbirth in 1855, and their son Cape was reared by his maternal grandparents. The James enumerated in Lincoln County was born in Virginia instead of Alabama. Erroneous information: James M. Thornton descends from the Dozier/Mark/Luke Thornton line of Virginia. These trees list James M.'s paternal grandparents as William Thornton and Clarissa Vice. Other mistakes were also found. For example, one person said he died in the Armory in Splunge, Mississippi. As a native of Monroe County, I got a big chuckle out of that one. Splunge does not and has never had an armory. The person obviously meant the town of Amory which is in that part of the county. However, James M. lived in the community of Splunge which was really a bit of a distance from Amory. Persons living in Splunge would have traveled to Amory when they needed to travel by railroad or when they needed items they could not get in the local community. I never accept the tree hints. I do, however, review them for hints AFTER I've worked through the hints given and made certain I have all the census records and checked other sources for key pieces that might be missing such as marriage records, birth and death records, cemetery records, etc. I then take any hints I find to see if those can be documented. Most of the time my own research and documentation has already uncovered the hints, or I can easily disregard hints because someone has added something that is very obviously erroneous, such as the parents being born after the child. Always check shaky leaf record hints also to make sure they apply to your ancestor. Recently I was reviewing shaky leafs on a different line on which I was working. I got 3 hints on this particular person. None of the hints were records for the individual on whom I was working. I searched and found the right records rather than accepting the ones given. In fact, I had to switch from Ancestry to Family Search to give me two critical records proved my own research was on the right track. Randy Seaver has asked us all to reminisce with 6 questions about our childhood this week's Saturday Night Genealogy Fun. What was your first illness as a child? I honestly have no idea. It was probably something pretty simple like strep throat. I do, however, remember the outbreak of Chicken Pox that went around my classmates in about the third grade. What was the first funeral you attended? Finally an easy one! I loved the Little House series by Laura Ingalls Wilder. While most people would say Little House on the Prairie was their favorite, I preferred Little Town on the Prairie. If you want to go to an even earlier age, my favorite book as a preschooler was There's a Mouse in the House. It was one of those little books you picked up at the dime store. It wasn't a Little Golden Book, but it was a similar series. What was your favorite class in Elementary School? I loved our second grade reading class with Mrs. Green. We had little reading groups that we got to name ourselves. I was the leader of the "Popcorn" group. A close runner-up would be third grade math class with Miss Davis. She was so fun! 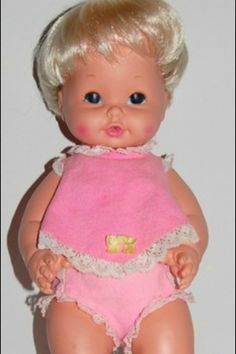 My mom always kept me well-supplied with dolls. In fact, my dolls were the envy of at least one of my neighbors. I would have to say that "Baby Tender Love" was probably the one I played with most because my friend Delores also got one that year. My Aunt Daisy sewed outfits for my dolls. My sister-in-law Sandy also made quite a few as well. I'm sure my mom even made a few. Did you learn how to swim, and where did you learn? I took swimming lessons from one of Dr. Moore's twin daughters at the Amory Municipal Swimming Pool. I actually became a very good swimmer and often won the races at church camp! Heather Rojo at Nutfield Genealogy posted about her connection to John Sanborn of New Hampshire. On her Facebook post, she asked if her Facebook friends were descended from John, and my reply was "yes." I thought it might be fun to include my line from John here. It would take "forever" to write a documented post so I'll leave documentation of the individuals and their parentage for future posts. I have not done extensive work on the Sanborn line, and I did learn the exact location in England where John was born from Heather's post! It's a post I've "pinned" for future reference. John Sanborn (son of John Sanborn and Ann Batchelder): born abt 1620 Brimpton, Berkshire, England; died 10 Oct 1692 Hampton, New Hampshire. I'm descended from his first wife Mary Tuck, daughter of Robert Tuck and his wife Joanna. Joseph Sanborn: born 13 Mar 1659; married Mary Gove 28 Dec 1682; died abt 1722, Hampton, New Hampshire. Abigail Sanborn: born 1 Apr 1686 Hampton, New Hampshire; married Ebenezer Dearborn 7 Oct 1703 Hampton, New Hampshire; died 26 Feb 1768 Hampton, New Hampshire. Samuel Dearborn: born 15 Apr 1745 Chester, New Hampshire; married Abigail Ward, daughter of Rev. Nathan Ward and Tamasin Ireland Ward, 22 Jul 1777 Plymouth, Grafton County, New Hampshire; died 22 Jul 1833 Plymouth, Grafton County, New Hampshire. Betsey Dearborn: born 4 Sep 1818 Malta, Morgan County, Ohio; married Stephen Taylor 8 Mar 1837 Morgan County, Ohio; died 12 Mar 1899 Oklahoma City, Oklahoma County, Oklahoma Territory. Laura Lucy Taylor: born 25 Apr 1854 McLean County, Illinois; married Abraham Lowden Lantz 15 Feb 1874 McLean County, Illinois; died 25 Sep 1922 Monroe County, Mississippi. Irving Lee Lantz: born 19 Nov 1885 Oak Grove, McLean County, Illinois; married Gillie Mae Hester 5 Aug 1917 Monroe County, Mississippi; died 5 Sep 1971 Amory, Monroe County, Mississippi. Dorothy Ann Lantz: born 30 Aug 1924 Monroe County, Mississippi; married James Thomas Thornton, Jr. 17 Mar 1946 Amory, Monroe County, Mississippi; died 22 Mar 2010 Amory, Monroe County, Mississippi. Elizabeth O'Neal over at Little Bites of Life has invited all genealogy bloggers to take a ride with the Doctor in the Tardis to meet one of our ancestors. It may surprise most of you that I am choosing to go back to the 19th century instead of further back in time. However, I could think of two ancestors that might be able to steer me in the right direction to continue pursuing their lines--W. Daniel Phillips and Thomas Duke. Thomas Duke is the one I chose because I know the next step will be in North Carolina, a state in which I visit the archives on a regular basis. What Question(s) Do You Need to Ask Him? Where in Virginia were you born? When did you move to North Carolina? When and where were you orphaned? Who were your guardians? Tell me about growing up -- what you did, your friends, your education, the places you lived. Who was your father? Where was he born? Who were his parents? Who was your mother? Where was she born? Who were her parents? Tell me any family stories you remember your parents or relatives relating to you. Tell me about how you came to Monroe County and any stops you made along the way. I'm certain that his answers would spawn additional questions. He would probably think I'm a pretty nosy outsider. I doubt he knew what an oral history project was. Fortunately the University of Mississippi admitted women in 1882 so I might be able to pull off my time-travel venture as an oral history project. While I have not researched it, I doubt that the Industrial Institute and College (now Mississippi University for Women) included such programs as history when established in 1884. Mississippi State University was found as an agricultural and mechanical land-grant university. No date for the first admission of women at it has yet been located. Will You Reveal Your True Identity to Your Ancestor? I doubt it. It would be too mind-boggling. Will You Bring Your Ancestor to the Future to Meet His Descendants? Why? It would not serve a useful purpose. Gates, Eva. Reading Up a Storm. New York: New American Library/Obsidian, 2016. Lucy Richardson, Bodie Island's librarian and sometimes sleuth, sees some unusual lights minutes before seeing a boat in distress. She calls the Coast Guard who rescues the couple. However, the man turns up dead the next day. Stephanie, a Raleigh attorney, is on a leave of absence to care for her invalid mother. The deceased turns out to be Stephanie's father. As Lucy and the local law enforcement investigate, plenty of motives and suspects turn up, even though the man has resided elsewhere for a long time. I really enjoyed the Outer Banks atmosphere on this one. I want to go back and read earlier installments and the next one too. 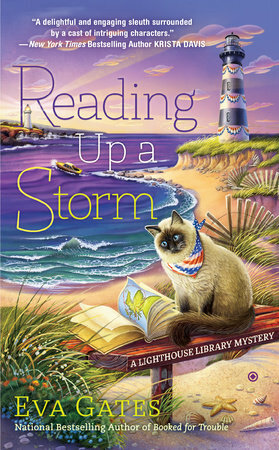 Libraries, lighthouses, cats, and North Carolina -- what's not to like about this combination? This review is based on an Advance Reader's copy provided by the publisher through NetGalley for review purposes.